Heart hug: Soothe Anxiety with body self-touch. Put your hand over your heart and feel your hand touching your chest. Here are a few simple calm down activities for children to help them unwind at the end of the day or play with just before bed time. We all need some moments of peace and quiet in our busy lives, and this helps both parents and children. Make Lavendar Play Dough. The subtle power of lavender helps to induce calmness and sleepiness. Pushing, squeezing and modelling with play dough is a great stress reliever in and of itself too. Get them to take out their tiffs in the dough! A rain stick is a great craft to make together. The sound it makes when turned over is wonderful! 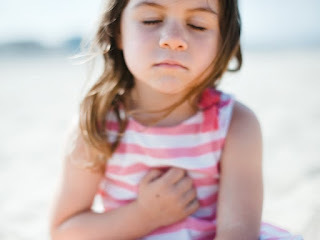 Children cannot help but keep on turning it over and over, listening to the gentle sound until they calm down. Discovery bottles are another great resource to have on hand. Filled with glitter, beads pom poms and more, the liquids and objects move slowly when turned and children can focus on them as they do so. Teach them to take deep breaths while they watch the objects moving and they should relax in no time! Blowing bubbles, whether for a younger sibling or just for themselves, is instantly calming as it requires focus and deep breathing. Of course it beings giggling too, but hopefully still in a happier way than their mood might have been in before! When children are anxious, even the most well-meaning parents can fall into a negative cycle and, not wanting a child to suffer, actually intensify the child’s anxiety. Here are some tips for helping children escape the cycle of anxiety. Help your child manage anxiety. The best way to help kids overcome anxiety is to help them manage and work through the feelings. Even if the things that trigger the anxiety seem minor or silly, the feelings are real and intense for the child. Talk about the feelings and triggers, share stories of others or your own past fears and anxieties, practice some calm, deep breathing, and empathize with the worry. When the child feels understood and held, he/she feels safe and strong and is better able to work toward overcoming the anxiety. Don’t over-react just because something make a child anxious. It is important to respect a child's fears and worries. These feelings mean something to them. It is important to try and understand what is behind them. Sometimes, well meaning parents are quick to try making things better or immediately and repeatedly remove the anxiety producing triggers. Once they are understood, a plan can be made to help the child overcome that anxiety at a pace that allows him/her to feel in control. You cannot promise a child that their fears are unrealistic, that they will not fail a test or that another child will not laugh at her during show & tell. However, you can express confidence that they are going to be okay and they will be able to manage it. This gives your child confidence that your expectations are realistic, and that you are not going to ask them to do something they cannot handle. What you do not want to do is be saying, with your tone of voice or body language is: “Maybe this is something that you should be afraid of.” Let’s say a child has had a negative experience with a dog. Next time they are around a dog, you might be anxious about how they will respond, and you might unintentionally send a message that they should be worried. We want our children to be relaxed, creative and alert. However, finding focus and space to think in this high-speed technological world can be tricky. Mindfulness teaches our kids to tune into their thoughts and feelings, which helps develop coping skills to handle anxiety and stress. The following are additional benefits of mindfulness. You can help your child develop self-regulation skills by incorporating simple activities into their daily lives. The following are tips that will promote your child’s self-regulation skills for school and life. Your child models your language, as well as the processes you use to make thoughtful decisions. When you weigh in your child’s ideas, you help them to develop the confidence and skills to think actively and independently. Playtime allows your child the ability to plan their own activities, find and develop interests, explore materials, problem solve and even use simple abstract thinking. Most importantly, these experiences support the idea that self-guided play and learning is valuable. Encourage your child’s independence by giving them age appropriate tasks to complete. This will spark confidence and create initiative within the child that will influence future behavior. Encourage your child’s language development by engaging them in meaningful conversations. Allow for your child to explore and explain thoughts and feelings. Model positive behavior management skills. Seek to understand your child’s limits and provide support to help your child gain control over his or her behavior. Encourage your child explore emotions and provide safe ways to cope with negative emotions. As a parent, you have likely observed that young children are not quite skilled in the art of self-regulation just yet (Tantrums!) and older children have some small capabilities (I can only handle so much before I explode!). While it is something that does develop as children mature, here are some ways to help strengthen self-regulation skills at home. One person is selected to be the traffic cop. All players stand on the starting line and the traffic cop has their back to the rest of the players. When the traffic cop says "green light," players try to run to the finish line. When the traffic cop says "red light," they turn around and players have to stop in their tracks. If the traffic cop catches a player moving, they are sent back to the starting line. The first person to cross the finish line wins and becomes the new traffic cop. How can you use this game to learn about self-regulation? After you play a few rounds of the game the traditional way, switch things up. Have your child run when you say “red light” and stop when you say “green light.” This simple switch will challenge your child to actively think about and practice breaking a habit. The old rules are no longer and we have to change the way we think and process to adapt to the new rules. While on the surface, it may look easy, it’s actually some pretty serious stuff. Go ahead and try this same idea out with a variety of other games like Mother May I? and the Freeze Dance (switch up the rules - instead of taking steps in Mother May I, make it hops, do it backwards, etc. and in the Freeze Dance, dance with no music then freeze when it starts, etc.). Another way to encourage self-regulation is to allow for independence, so be sure to hand the over the reins to your child after they get the hang of it. You will get a moment to catch your breath and your child will enjoy feeling like they are in control. It’s a win-win! This area of development involves learning to interact with other people, and to understand and control your own emotions. Developing the ability to control your emotions and behavior is also a long process. Children continue to develop their social-emotional skills well into their teenage years, or even young adulthood. The following are some of the typical developmental milestones for children 5-7 years of age. If you notice any of these by the time your child is 7 years old, you may want to talk to your doctor, or another health professional such as a mental health clinician, a speech-language pathologist, an occupational therapist, or a psychologist. This area of development involves learning to interact with other people, and to understand and control your own emotions. Developing the ability to control your emotions and behavior is also a long process. Children continue to develop their social-emotional skills well into their teenage years or even young adulthood. The following are some of the typical developmental milestones for children 4-5 years of age. If you notice any of these by the time your child is 5 years old, you may want to talk to your doctor, or another health professional such as a mental health clinician, a speech-language pathologist, an occupational therapist, or a psychologist. The following are some of the typical developmental milestones for children 3-4 years of age. If you notice any of these by the time your child is 4 years old, you may want to talk to your doctor, or another health professional such as a mental health clinician, a speech-language pathologist, an occupational therapist, or a psychologist. Toddlers develop relationships with the people around them right from birth, but the process of learning to communicate, share, and interact with others takes many years to develop. The following are some of the typical developmental milestones for children 2-3 years of age. If you notice any of these by the time your child is 3 years old, you may want to talk to your doctor, or another health professional such as a mental health clinician, a speech-language pathologist, an occupational therapist, or a psychologist.